He stressed that “Resistance groups in Iraq are popular and precious to people. Among the most important are Al-Nujaba, Asa’ib Ahl al-Haq, Kata’ib Hezbollah and Kata’ib Seyed al-Shohada “. He added “Al-Hashd Al-Sha’abi was formed by Maraji’s (sources of emulation) Fatwa. Many members of the Resistance groups are in Al-Hashd and because of their experience in fighting the Americans, they have great military capabilities”. Speaking on legal position of Al-Hashd and clarified “Al-Hashd was in contact with Iraqi Prime Minister since its very formation, and he granted legality to this group. Each Resistance group in Al-Hashd has its own distinctive characterstics and they are different from other groups regarding military trainings and jihadi ideology from other military forces in Iraq”. Remarking on Al-Hashd’s merging he said “Al-Hashd’s merging has to follow a special procedure. It is a wrong decision if they merge but lose their distinctive characteristics”. Speaking about West’s motif to stop Al-Hashd’s participation he clarified “Western countries, especially the U.S, do not want Al-Hashd’s participation because they know that our presence in Mosul will ruin their colonial plans and will not let these countries establish permanent military bases in Iraq again and threaten the integrity of this country. He added “currently, Turkish military forces are present around Mosul and they have occupied some areas in northern Iraq. Also some countries supported this action. This is why we insist on Al-Hashd’s presence in Mosul. Speaking about Mosul of liberation he stated “after liberation of Mosul, we will face some security, cultural, and political issues in Iraq. Some people have been misled by ISIS and need to be reintroduce to true Islam. We are responsible in ideological purification of Mosul. Sunni scholars, clergymen, and villagers are also responsible in enlightenment. He added “after liberation of Mosul, regarding security, we need to fight with terrorists. ISIS targets civilians in crowded areas and we need to employ some tactics to tackle these security threats. He stated “ISIS is the continuation of Al-Qaeda which the U.S is responsible for its formation. The U.S is also responsible for creation of ISIS and Al-Nusra Front. Saudi Arabia is founder and promoter of Wahabism in the region. Turkey and Israel also support different terrorist groups like “Ahrar al-Sham” in northern and southern Syria”. Arguing that introduction of moderate armed groups in Syria by the U.S is to deceive the media and clarified “Al-Nusra Front, Ahrar al-Sham, and Jaysh al-Islam belive in the same thing as ISIS. None of these groups are moderate and Saudis have funded their arms. He remarked “the Saudi ambassador is in contact with Daeshi politicians. Daeshi politicians are ministers and parliament members who are supported by Western and Arab countries and follow their plans”. In another part of the talk Sheikh Akram al-Kaabi said “Turkey is trying to improve its position in Iraq and Syria. Ankara cooperates with Zionists and Washington to carry out its plans in the region”. He added “Turkey has sent troops to Syria and Iraq without their permission. We consider them occupation forces and they must leave northern Iraq. 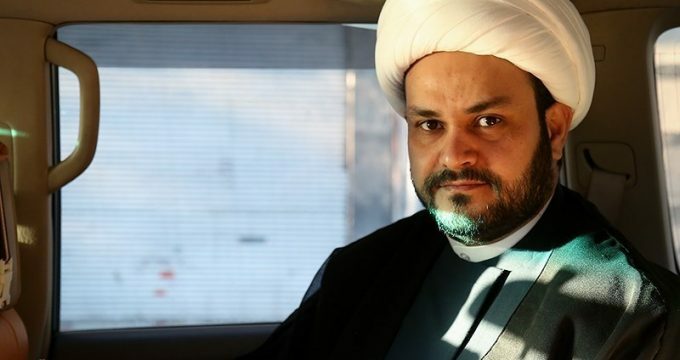 Pointing out at the ideological foundation of Resistance groups in Iraq he stated “Resistance groups in Iraq believe in leadership of Vilayat-e Faqih and Islamic Republic has been formed to help the oppressed. We believe that our ideology has followers everywhere in the world and justice must be established all over the world”. Speaking about Iraqi Defense Ministers dismissal he said “the Iraqi Defense Minister does not participate in military operations because Iraqi military and security forces do not have any connections with him. These forces are in contact with the Prime Minister and the Defense Minister’s dismissal does not affect Mosul Liberation operation”. Stressing on Supreme Leader’s role in the Resistance Axis’s victories he clarified: Imam Khamenei’s wisdom and insight has affected our beliefs and we achieved a great deal through his insight”. In the end he said “Iran has helped Resistance groups in Iraq a great deal so that they can fight against terrorism in their country. If Iran did not help, there would have been a disaster in Iraq. But through Iran’s help and support we were able to gain many victories against terrorist groups in Syria and Iraq. Iran plays a very positive and big role in fighting terrorism and Iranian people love Iraq and Iraqi people.